During her life Miriam Makeba, who has died aged 76, reached the heights of international success and fell into tragic lows many times. "One minute I'm dining with presidents and emperors; the next I'm hitch-hiking," she told an interviewer in 2000. The Johannesburg club singer became a voice for the anti-apartheid struggle in South Africa. Despite saying many times her songs were not political, she paid a high price for her activism. The South African government revoked her passport, effectively sending her into exile for 31 years. After her 1968 engagement to Stokely Carmichael in 1968, a leader of the radical Black Panthers, American record labels dropped her and her performance bookings were cancelled. "I just told the world the truth, and if the truth then becomes political, I can't do anything about that," she told culture website Salon.com in 2000. Her career was also blighted by poor financial management, which meant she had to keep performing no matter what else was happening in her life. 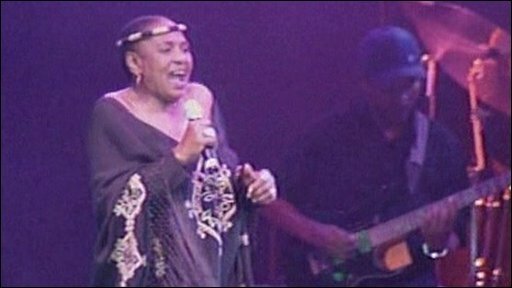 She said she couldn't cancel concerts - in 1998 she missed Mr Carmichael's funeral in Guinea because of her singing commitments. She was born in 1932 in Johannesburg to a sangoma, or traditional healer. Her father died when she was six. In the 1950s she sang with township jazz bands but didn't make much money from playing clubs and bars. Despite being a successful recording artist, she didn't receive any royalties from her records. In her early career, she and her band were involved in a car crash and the police rescued only the white victims in the other car and left her and her band-mates on the road, where three of them died. The only money was in touring Africa, playing jazz clubs from Rhodesia (Zimbabwe) to the Belgian Congo (Democratic Republic of Congo). It wasn't until 1959 that she came to the world's notice. She played a leading role in an all-black musical about South African boxing legend Ezekiel "King Kong" Dlamini. "That was the only time my mother saw me on stage," she told friend and journalist Gamal Nkrumah in 2001. "At one point in the play I am strangled and my mother jumped from her seat and screamed: 'No. You will not get away with murder. You cannot do this to my daughter.' Friends explained to her that this was not for real - that we were acting. But she made such a fuss. Everyone was so embarrassed. On stage my heart sank." Also in the cast was trumpet player Hugh Masakela, who would become her third husband years later when they were both in exile the US. Her first spouse was a black South African policeman, who she divorced because of his violence. She also married another musician, Sonny Pillay, during her stay in England. In the same year she starred in the anti-apartheid drama-documentary Come back, Africa, about the lives of migrant workers living in Johannesburg's townships. It was filmed around the Johannesburg neighbourhood of Sophiatown, partly with secret cameras and partly under the pretence of being a film about street music. The film was smuggled out of South Africa and shown at the Venice film festival, where she got permission to travel for the premiere. From Venice she and Mr Masakela travelled to London. It was there while singing on the BBC radio show In Town Tonight that Makeba met Harry Belafonte, who would open up the road to world stardom for her. She became a massive hit in the US. People packed her concerts and she performed with stars. Her blend of African rhythms and jazz in songs like Pata Pata appealed to both conventional audiences and the trendy jazz crowd. In 1962 she played at the US President John F Kennedy's legendary birthday party, where Marilyn Monroe sang Happy Birthday. But the South African government had hit back for her role in Come Back, Africa. In 1960 she found they would not let her home to attend her mother's funeral. "The man at the desk took my passport. He did not speak to me. He took a rubber stamp and slammed it down. Then he walked away. I picked up my passport. It was stamped 'Invalid'. 'They have done it,' I told myself. 'They have exiled me," she said in 2001. She was shocked by the racial tensions she found in 1960s America, and called it "apartheid by another name". But Harry Belafonte advised her to play a less confrontational role in the civil rights movement. "He was a good teacher and looked after me," she told the Guardian earlier this year. "He said: 'You have such great talent, you must try not to be a tornado - be like a submarine. It was good advice when I found myself speaking at the UN Committee Against Apartheid and then the UN General Assembly." But her relationship with racial firebrand Stokely Carmichael ended her career in the US. They moved to Guinea and were given a home by President Sekou Toure who paid her a salary to write and perform. She also worked as a UN representative for Guinea for many years, for which she was given the Dag Hammarskjold peace prize in 1986. By then, stricken by grief at the death of her only child Bongi in 1985, she had left Guinea and moved to Brussels. Her relationship with Mr Carmichael had ended in 1973. Bongi died giving birth to a stillborn child but Makeba has two other grandchildren, Nelson Lumumba Lee and Zenzi Monique Lee, and three great-grandchildren Lindelani, Ayanda and Kwame. In 1990 she returned to South Africa for the first time after Nelson Mandela asked her to come back. In her increasing old age "Mama Africa" as she was known, began suffering from osteoarthritis and shortage of breath. She began a "farewell tour" in 2005 before retiring, but it stretched out for three years more. "Everybody keeps calling and saying: 'You have not come to say goodbye to us," she told an interviewer in May.